Back to South African seafood..
Mussels in South Africa are still very cheap and easily found. They are frozen but that is fine. They are also farmed extensively and to be quite honest, the farmed mussels are far nicer than freshly collected in my opinion. Maybe its just because there is no grit, no beardy bits and no sore hands!! Just a tip for collected mussels. Put them in a netting bag overnight in a rock pool. They will purge any sand. Dont even try and pull off the beardy bits like all the cook books tell you...snip them off with kitchen scissors. To open and remove the half shell, just dump the mussels into a large pot of boiling water for a minute, then drain them. Use a small sharp knife and sever the muscle on the inside of one shell half and break off that same shell half. But like I said. Rather buy frozen prepared half shell mussels! 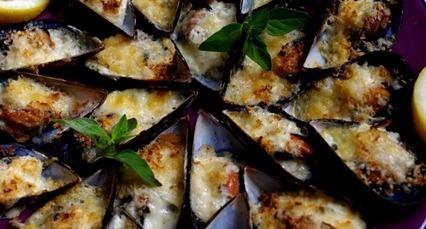 For a good large snack or light meal for 4 people, use one and a half kilo of half shell mussels. 250ml butter melted. You can also use a light olive oil which gives a whole different flavor slant. I often use half and half as I find butter a bit rich for me personally. Melt the butter and add the garlic, black pepper and a pinch of cayenne pepper. DONT cook the garlic. You need pure flavor here. Lay all the shells out on a baking tray and spoon the melted butter and garlic into each shell. Sprinkle with the chopped dill and a pinch of breadcrumbs which helps capture the juices. Grill until the mussels just start to shrink and serve immediately in the pan with fingers of fresh bread to mop up the juices! There will be No complaints I promise you! You are so lucky to find such a nice fish where you are. Great place to be! These mussels look just perfect for a light lunch. Ciao! You are right there, but even frozen mussels are very nice. One of the few sea products that dont seem to deteriorate too much with freezing. This is a great tutorial for folks like me who've never cooked fresh mussels before. I've watched tv personalities prepare them multiple times, but it always helps to have step-by-step help for tasks like this. Hi Archi! Thanks so much for coming by my blog and leaving a comment! Nice to hear from you again. 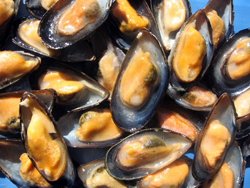 Your mussels sound wonderful but they are not commonly available here in Istanbl, at least not on a domestic basis. They are not that easy to get in land locked Botswana, but I have an excellent delicatessen who ships even fresh oysters inland! As I say though, the frozen blanched farmed mussels are really just as good or better than fresh. and come with approximately all important infos. I would like to look extra posts like this .